Astronomers using the NASA/ESA Hubble Space Telescope have captured the images in this amazing space wallpaper showing the dancing auroral lights at Saturn’s north pole. Astronomers using the NASA/ESA Hubble Space Telescope have captured the images in this amazing space wallpaper showing the dancing auroral lights at Saturn’s north pole. Taken in April and May 2013 from Hubble’s perspective in orbit around Earth, these observations provide a detailed look at previously unseen dynamics in the choreography of the auroral glow. 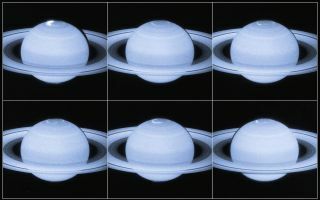 The ultraviolet images, taken by Hubble’s super-sensitive Advanced Camera for Surveys, capture moments when Saturn’s magnetic field is affected by bursts of particles streaming from the Sun.